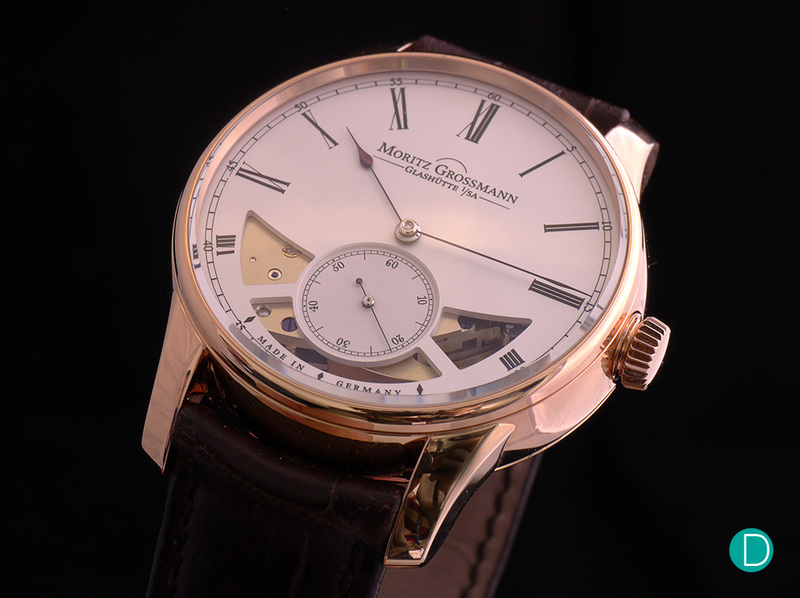 Moritz Grossmann’s first automatic watch reveals the maison’s new approach to self-winding. It features a modern interpretation of an older-generation device: a pendulum mass, referred to as an automatic hammer mechanism. Christened ‘Hamatic’, this piece transforms automatic winding into a fascinating visual experience within a brand new 106.0 calibre. Compared with standard rotor-based systems, this automatic hammer system is a thorough rarity. It works by transferring power from a moving bi-directional hammer with a heavy gold head that sits on a fine stem. 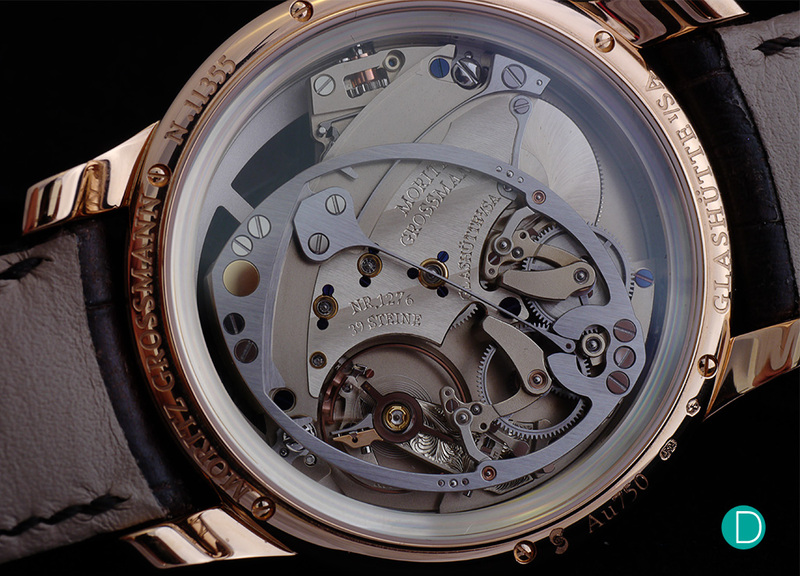 The oscillating hammer can be seen clearly in motion through not only the see through caseback, but also through the semi-skeletonized dial. As well as being a visual treat, the system is highly energy efficient. And, fully-wound, it has a power reserve of 72 hours. 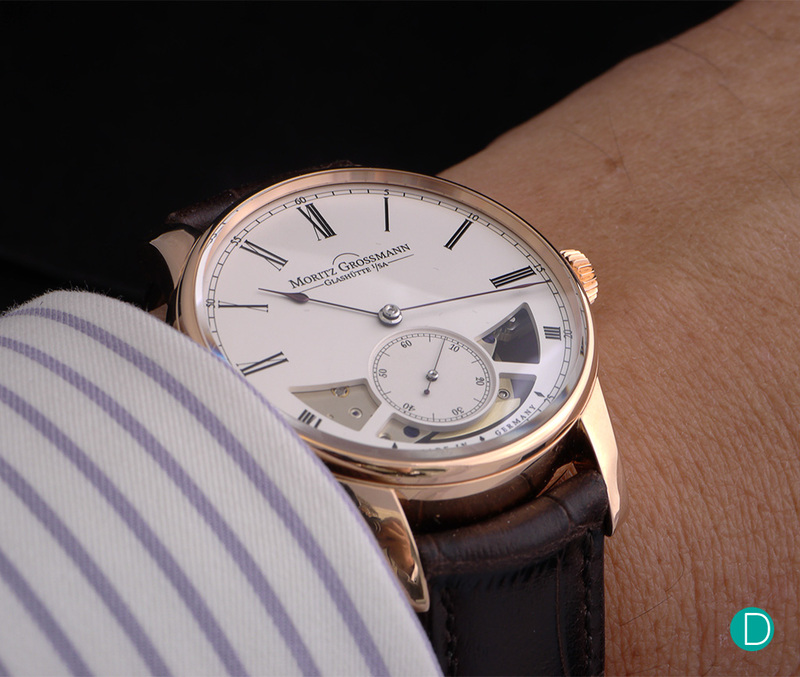 The 18K pink gold case measures 41 mm in diameter and 11.35 mm thickness. 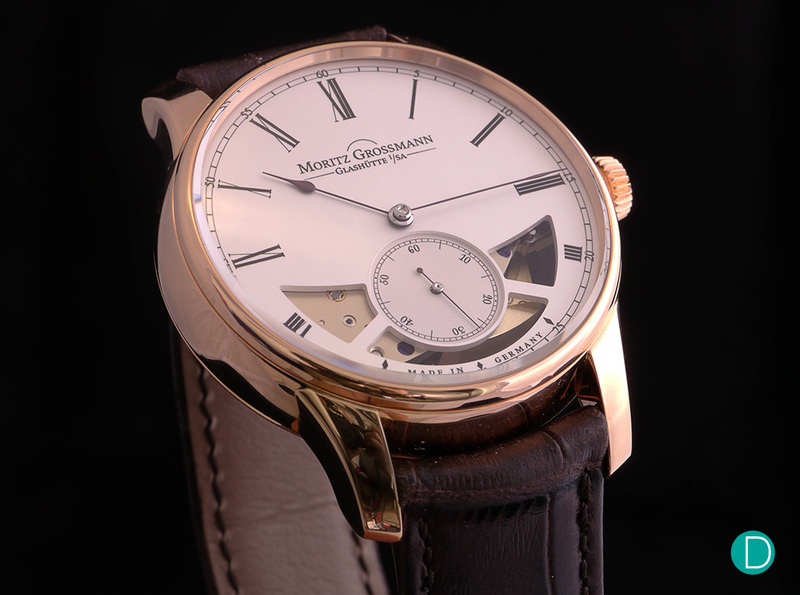 A classic design similar to the other watches produced by Moritz Grossmann, the case features a simple tapered lugs design with chamfered edges. The case is fully polished and is fit with a raised sapphire crystal glass. 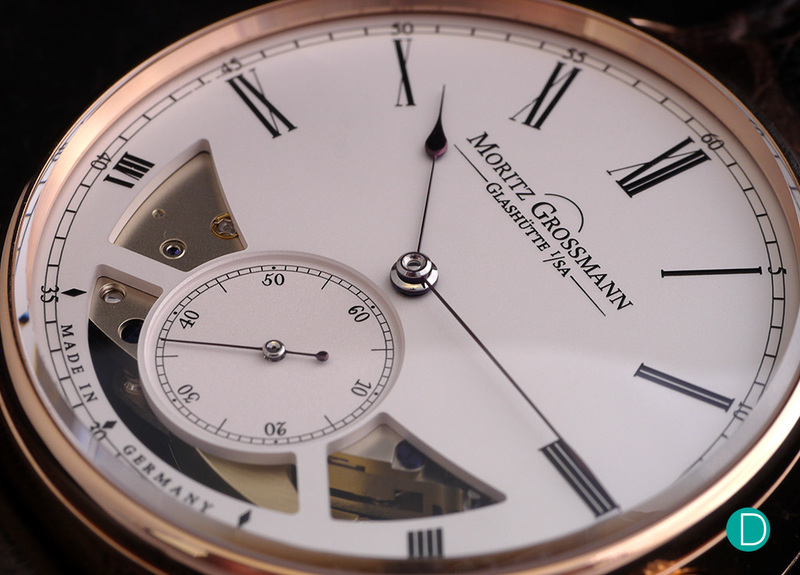 The 18K pink gold case measures 41 mm in diameter and 11.35 mm thickness. 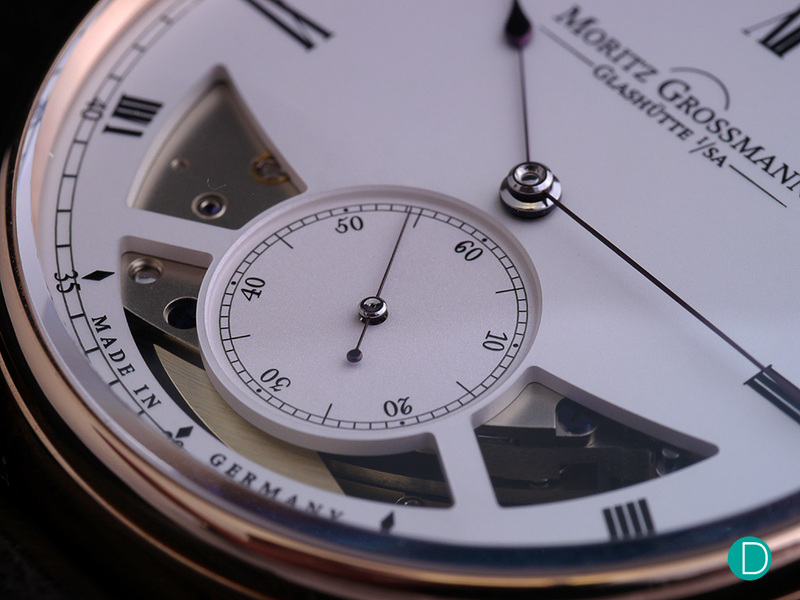 Aesthetically, the dial is inspired by pocket watches crafted in Moritz Grossmann’s nineteenth century workshop. Long Roman numerals are surrounded by a periphery minutes railway track. The white-silver dial has a grained texture, with a darker tone used on the sunken seconds sub-dial. The watch is a traditional seconds at six time-only watch. But the re-inventiveness of the movement and dial suggests sound engineering behind the watch, some quip as typical ‘German’ over-engineering. The oscillating hammer can be seen clearly in motion through not only the see through caseback, but also through the semi-skeletonized dial. That said, the classic DNA of the timepiece is still firmly kept with the overall dial and case design, with the icing to the cake done with a pair of super-fine, poire shaped hands – as always hand-sculpted in the manufacture. This brand new, 324-part, 39 jewel mechanism, is a classic pillar movement with a 2/3 plate but was extensively redesigned for the Hamatic. It beats at 21600 Vph and has both self-winding and manual winding capabilities. This calibre 106 is a 324-part, 39 jewel mechanism, a classic pillar movement with a 2/3 plate extensively redesigned for the Hamatic. The bi-directional automatic hammer mechanism relies on the interaction of the hammer body with the hammer head and the hammer spring. The oscillation of the hammer spring is transferred to the hammer body via a sapphire roller. The system is designed for efficiency and dependability. Under gentle motion of the hammer, energy transmission is nearly loss-free. At higher accelerations, excessive deflections are controlled by a catch slider and fixed end stops. The bi-directional automatic hammer mechanism. The Hamatic system features a click mechanism integrated in the rotary axis of the hammer body; it serves as a bidirectional winder. The oscillations of the hammer body are picked up by two click levers and converted into a continuous rotary motion powered by the alternating direction of rotation of the click wheels. The rotary motion is transferred to the free wheel via the reduction wheel and then to the ratchet wheel of the mainspring barrel. The manual winder is designed as a yoke winder that is mounted on a separate bridge. Its simple and functionally reliable design has proved to be an ideal complement to the automatic winder. When the Hamatic system is activated by motion, the manual winder is disconnected from the ratchet wheel by the yoke. The tip of the hammer as seen through the dial. In the manual winding mode, the reduction gear is isolated from the ratchet wheel by a click-pawl idler. When the crown is pulled, the balance is stopped to enable hand-setting. At the same time, the crown wheel and the ratchet wheel are disengaged by the yoke. When the crown is pushed home again to the winding mode, the balance stop is deactivated and the yoke pivots into the ratchet wheel. The 41 mm watch on the wrist, an appropriate size although most classic watches are recently on the downsize to a 39 mm average. 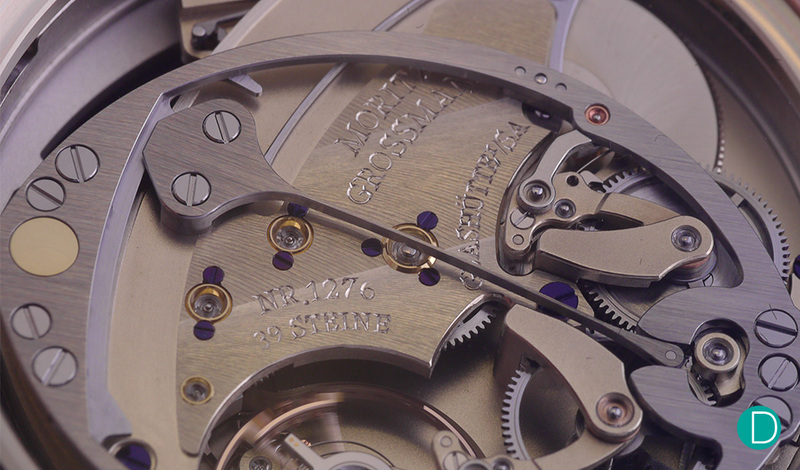 The new calibre is the primary sell point for the watch. While it remains to be seen how significant the changes are in time-keeping, the change will be much welcome by those who simply want something different, or rare. That said, while the movement’s visual design viewed from the caseback is nice to look at, the dial side of the watch is still rather plain. Understandably, the watch pictured is a prototype, and hopefully additional finishing will done on the movement of the final product, especially for the exposed parts on the dial side will add to the art factor of the watch.